In the same house: Deanna (mummy), Sue (mumma) & Noah, three. Sue has two sons in their 20’s. Noah is close to his grandparents (Deanna’s parents) and was adored by Sue’s mum before she died. Noah is close with his little cousins. Noah has a group of donor siblings that we are in regular contact with – other children with two mums who have the same sperm donor. Then there is one year old Venice and her two dads. Deanna gave birth to Venice in October 08 for her gay dads. To have Noah we chose a man that we met through Pinkboard. We used at home inseminations and were lucky to achieve pregnancy first go . We met Venice’s dads with a view to being their surrogate, she was conceived with at home inseminations also. We had an early miscarriage the first month and then got Venice the next month we tried. Very lucky indeed ! Do you have a relationship with your donor/the family to whom you are a surrogate? Noah’s donor was to be a known donor. He agreed to have casual contact with Noah via email, phone and the occasional visit. We wanted someone Noah could send fathers day cards to, someone that he could call dad and be able to say to the kids at school, ‘My daddy lives in Sydney.’ The donor was happy for this at the time. We knew the donor had other children like Noah and made it clear to him that we would be happy to have contact with the other children and their mums, and at the time the donor agreed. Time has turned that arrangement sour. When we came across another couple with one of Noah’s siblings, the donor, for reasons unfathomable, tried to warn us off mixing with these women. He then proceeded to ring all the mothers of these children and tell them he would have nothing to do with any of us if we continued to mix with these women, accusing them of things they simply have not done. Unfortunately, we believe the main reason he wanted to have control over who we mixed with is because we now realise the extent of his donations goes way further than any of us could have dreamed. He is a serial donor and we believe there are upwards of 20 + children out there. He has slandered us to the other mothers and we have copped flak from women who have never met us based on this “kind generous man’s word”. He now has no contact with 5 of these children simply because he can’t control who their mothers socialise with. A case of beware of the serial donors! Had we had the opportunity to meet Venice’s dads before we had Noah we would have had a tribe with them! When discussing having Venice I made it clear that I couldn’t do it if they expected me to completely walk away. Venice is being raised by her two dads in a town four and half hours drive away from us. We get regular photos, emails, phonecalls, and skype calls. We see her two to three times a year. The guys tell her I am mum, they keep a photo of her and I beside her bed. My parents and extended family are encouraged by the guys to be in contact with Venice. The relationship between us and them is a positive one which focusses on what’s best for Venice. Noah knows Venice is his little sister. As Noah and Venice get older they will spend time together, and Noah will be able to go to the guys in school holidays and vice versa. What are some things you do that maintain or promote good relationships with the other people in your family network? That’s a hard one. Noah’s donor basically gave us an ultimatum: in order to maintain contact with him, we had to do as he said. That got my back up and made me question why he felt the need to control the women he had donated to.We decided that Noah building a relationship with his donor siblings, would in the end, be more valuable than risking his donor pulling away from him when it suited him and leaving a very hurt and confused little boy. So those siblings we do have contact with are family. We have get togethers, we email, swap photos and stay in touch. The premise of our relationship is fostering relationships between the children, however we all seem to click. We have vast differences in backgrounds and lifestyles, but we all seem to be in tune on some intrinsic level. As for maintaining a relationship with Venice’s dads, we seem to have similar parenting styles, and I guess it helps that they think I can do no wrong, hehehe! But with the main focus on doing what’s best for Venice and Noah and putting the kids before the adults it seems to be working well. Three words to describe each member of the family? Deanna = gregarious, generous, trusting, Sue = patient, tolerant, kind. Noah = gentle, bright, oldsoul. Noah, loves anything to do with the Wiggles, he sings and dances and plays his wiggles guitar, and drives around in his big red car dressed as Anthony Wiggle. Venice has just in the last few days started walking so she is into exploring ! We enjoy getting together with our extended family both rainbow and bio. Tamworth has a lot to offer if the kids are into sport, otherwise it’s left a bit wanting! I’m tough. Noah is very intelligent and very stubborn. He does get the occasional smack, he gets timeouts, he has a routine and is expected to do chores – yes, chores! He has been ‘feeding the dogs’ since he was two, (he carries the bowls in and gives each dog their bowl and goes back and collects the empty bowl), he also puts his dirty clothes in the washing machine, asks to leave the table, says please and thankyou. Perhaps I’m a bit old fashioned but children learn from the minute they are born. How confusing for them to have adults let them do things in their first few years because they ‘are just a baby’ and then turn around and try to rein in the stuff society finds unacceptable when they are older. It confuses them. Noah has been given boundaries from the beginning, and he worked out pretty quickly that if he pushed those boundaries there would be consequences. After all in the adult world, when we push boundaries we face consequences – children who don’t learn this I believe become children whose parents are tearing their hair out when they reach their teens. We constantly have people remarking on what a fantastic little boy Noah is. Only in so far as I’m probably more determined not to raise a “juvenile delinquent,” for want of a better term. I realise the stigma is there, and I guess a part of me feels we have to ‘prove’ ourselves. We are out and proud, and Noah has a multitude of books with rainbow family themes. He goes to PFLAG meetings. I guess it means he will be raised in household tolerant of differences, he’ll have an understanding of what it feels like to be part of a minority. We hope to instill in him empathy for those around him, he’ll see that there are no men’s roles/women’s roles; that everyone gets in and does what needs to be done. It’s probably stronger. We’re not your ‘average’ lesbian couple because of Sue’s health. It’s difficult to explain ! Not really, just the parenting gig in general can be so hard whether gay or straight ! 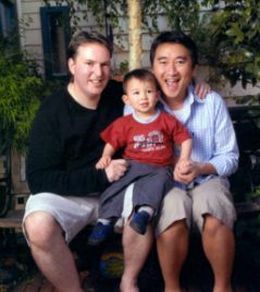 What is great about being a rainbow parent? I have always liked to stand out in a crowd and can be a bit of a show off, so it suits me most of the time to be different from the majority. I use every opportunity I get to educate the straight community. Work colleagues ask me lots of questions about how it all happens and I delight in answering them openly and honestly. Having a child in some respects makes you more OUT there, in that there are many more opportunities for coming out. At the same time it makes you less visible within the gay community because there are still a lot of lesbians and gay men who don’t have time for us ‘breeder’ lesbians. How has your extended family responded to the creation of your family? How have you responded to that? We have been extremely lucky that nobody in our extended family has been negative. Knowing my personality as my extended family does, they wouldn’t be game ! My parents, Sue’s mum before she died, my grandparents, aunts, uncles, cousins have been supportive. I’m not naive enough to think there haven’t been whispers behind my back, especially from some of my extended family, but they’re not game to say anything negative to my face. I tell the truth. I look them in the eye and tell them exactly what they want to know. Most are just curious because it is such a foreign concept to the average straight person. I use it as a chance to educate. Sue’s youngest bio son, who is 25, tells everyone Noah is his little brother. Sue, when she has Noah out on her own, has been called grandma (she’s 49) by people. She will correct them and say, ‘No I’m his mum.’ They inevitably make some comment about her having him late in life. Just the other day she had someone say, ‘Your other half must think Noah’s wonderful.’ Sue says, ‘Yeah SHE does.’ They get it then. Not really …I guess on a small scale now that Noah is getting more aware and going to day care with kids from straight families, there are two little boys in particular who drum the ‘daddy’ thing into their play. The carer is clueless when it comes to rainbow issues, and I’m not sure that tackling her with some education would make much difference. I’m just looking forward to next year when those little boys won’t be there ! How do you model pride in rainbow families to your children? We tell Noah he’s very lucky to have two mums, special little boys and girls have two mums or two dads. He can tell you by pointing to photos who his brothers and sisters are. He will be raised knowing they are a special family, to be proud that he has brothers and sisters and lots of aunties and uncles in his rainbow family. We don’t hide who we are in front of him, we give him no reason to think that our family has anything to hide, we’re open and honest in public and in private. 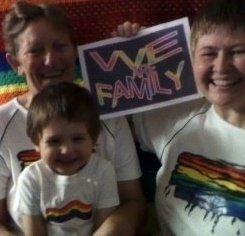 Noah has books, and clothing that are all rainbow family proud. I think people need to surround themselves with genuine friends and family, whether they be blood related or not. Children are hard work and you should have a group/community around that will help out when the going gets tough. Another good advertisement for co-parenting arrangements; it gives you a chance to have a break. Some parents (very few ) don’t ever feel they need a break, but most of us if we’re honest, do need timeout from the kids, so how wonderful for the kids that end up with two mums and two dads, for example, to share the burden ! Networking and being in touch with other rainbow families is important. It lessens the feelings of isolation you get from being surrounded day in day out by straight families and people. Go for it, don’t be afraid to explore all your options, keep an open mind, don’t close yourself off to possibilities ! There should be no taboos whilst ever the interests of the child are at the forefront. If people go into a parenting arrangement with the ‘good’ of the child as paramount you can’t go too far wrong. Do your homework. For us even finding out that we have a serial donor and donor siblings all over the country side can be turned into a positive if the children are not lied to and / or encouraged that their situation is shameful. Noah will be raised to feel special that he has so many siblings. There are so many guys and girls out there who would dearly love to parent, and I have a hard time understanding why we can’t all help each other out. It’s probably lucky for me I didn’t start my parenting journey until I was 36 or I would have had 10 all over the countryside ! I’m a 20 year old lesbian who lives in Rochedale South. My partner and I have been together for about a year and we’ve talked about kids but it’s not on the agenda yet. Merely knowing that we’d both have the same rights as heterosexual couples is a comforting thought for the future. It’s not always been easy, I’ve known I was gay since Year 7 but I didn’t fully understand or realise till I was in Grade 9. My Grandparents who I adored condoned gay people and they even banned me from reading about any form homosexuality unless it was saying that it was wrong. I felt so trapped and so alone. Most of my school years were spent in a deep depression where I didn’t really want to live out of fear that anyone would find out and then think I was a “dirty” person. I was afraid my Mother would kick me out, she has much the same views as my grandparents. One night she saw a gay couple on the news and said to me “I would never disown you if you were gay, but I wouldn’t love you as much”. It was an excruciating experience. I think that acts like these are very important, they influence people to understand rather than judge. I see gay young teens now and how easy it is for them to be out. It’s only taken 5 years to advance with such change to the way people interact and think about gay people. It’s not just important for gay people to support this, straight people should too. What happens someone you know has to go through the same thing that I did, I would never wish that upon anyone. Having things like this makes a community realise that it’s okay if you disagree with it, it’s okay if you agree with it, but we need to have equal rights. Thanks for your time. I love Leah’s letter to the Community Consultation because it reminds me that I’m not just fighting for equal rights for myself, but for a better life for all the young gay and lesbian folk coming up after me. It gives me a sense of community, and also of being – not exactly an elder (because surely I’d have to be, you know, old) – maybe a mentor, or a role model of one way it’s possible to live a good life as a lesbian.